What’s for dinner tonight? I have a delicious recipe for Chili-Roasted Salmon and Veggies to share with you that’s quick, satisfying and might be just the new dinner recipe you’ve been waiting for. 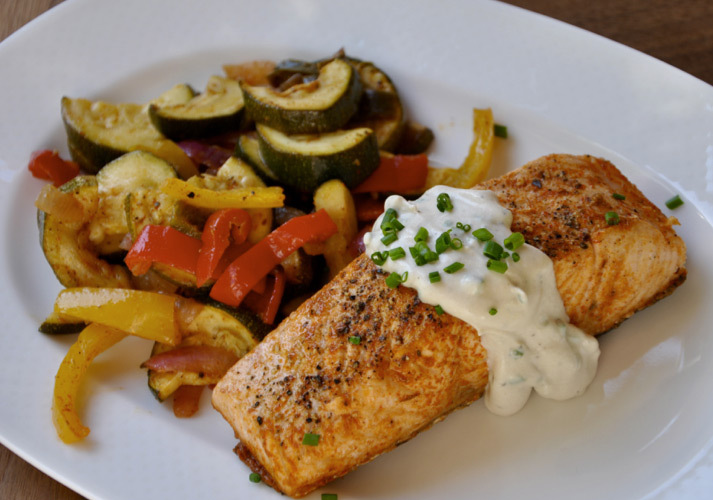 The best dinners to fuel your fitness results are a combination of fresh, fiber-rich vegetables and quality protein, like this Salmon and Veggie dish. Enjoy! 1. Preheat the oven to 425 degrees F. Lightly grease 2 large rimmed baking pans with olive oil. Arrange the salmon fillets on one of the pans and generously season with salt and pepper. 2. In a small bowl combine the lime juice, garlic, chili powder, cumin and 1 teaspoon of the olive oil. Pour half of the spice mixture over the tops of the salmon fillets. 3. In a medium bowl toss the zucchini, bell peppers, poblano pepper and red onion with the remaining 2 teaspoons of olive oil and with the remaining spice mixture. Spread the veggies over the remaining pan and generously season with salt and pepper. 4. Place both pans in the preheated oven for 20-30 minutes, until the salmon is flaky and the veggies are tender. Mix the mustard sauce ingredients in a small bowl and serve over the salmon. Enjoy!